US: Apollo 16 astronaut Charles Duke did not just leave his footprints on the Moon, he also left a family photograph on his historic trip to the lunar surface 40 years ago. Astronauts Charlie Duke and John Young embarked on a lunar mission on April 23 1972, to explore the Moon's Descartes Highlands in a Lunar Roving Vehicle. Before setting up a Solar Wind Collector, Lunar Module pilot Duke left a photograph of himself with his wife and their two sons, Thomas and Charles, sitting on a bench. It remains there till this day, the 'Daily Mail' reported. The reverse of the photo is signed by Duke's family and bears the message: "This is the family of Astronaut Duke from Planet Earth. Landed on the Moon, April 1972." 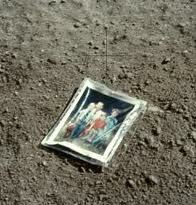 Duke photographed the family picture with a Hasselblad camera as it rested on the dusty surface next to one of his boot prints. The image was unearthed in the Project Apollo Image Archive, which serves as an on-line reference source and repository of digital images pertaining to the historic manned lunar landing programme. Duke also left a commemorative medal issued by the US Air Force, which was celebrating its 25th anniversary in 1972. Apollo 16 was the tenth manned mission in the US Apollo space programme, the fifth to land on the Moon and the first to land in the lunar highlands. The crew was Commanded by John Young, along with Lunar Module Pilot Charles Duke and Command Module Pilot Ken Mattingly. Launched from the Kennedy Space Center in Florida on April 16, 1972, the mission lasted 11 days, 1 hour, and 51 minutes, and concluded on April 27. It was also the second flight of the Lunar Roving Vehicle which was used to transport Young and Duke 26.7 kilometres across the Moon's surface. At the age of 36, Duke became the tenth and youngest human to walk on the Moon. After setting foot on the lunar surface, Duke exclaimed: 'Fantastic! Oh, that first foot on the lunar surface is super! The pair spent just under three days on the Moon's surface, during which they conducted three extra-vehicular activities or moonwalks, totalling 20 hours and 14 minutes, and collected 95.8 kg of lunar samples to take back to Earth.